Buenos Aires, Oct. 12 (BNA): Bahrain’s hopes of claiming a medal at the 2018 Youth Olympic Games, being held in Buenos Aires, suffered a major blow today. 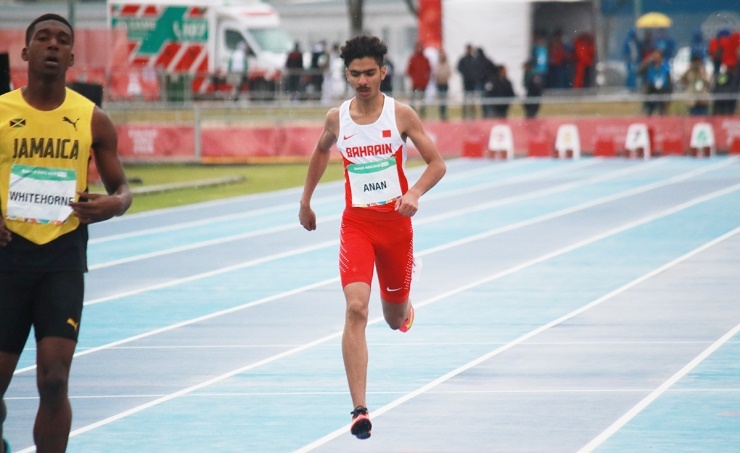 Yusuf Anan was the first of a two-member Bahraini athletics team going into action, but his medal quest ended sadly as he came fifth in the men’s 400m heat at Parque Polideportivo Roca sports facilities in Southern Buenos Aires. Buenos Aires, Oct. 12 (BNA): Bahrain’s hopes of claiming a medal at the 2018 Youth Olympic Games, being held in Buenos Aires, suffered a major blow today. Yusuf Anan was the first of a two-member Bahraini athletics team going into action, but his medal quest ended sadly as he came fifth in the men’s 400m heat at Parque Polideportivo Roca sports facilities in Southern Buenos Aires. Lined up in the fourth heat race along with athletes from USA, Turkey, Sri Lanka, Malawi and Bermuda, the 16-year-old Bahraini was unable to finish among fastest eight athletes in all five heats and therefore missed any chance to qualify for the semifinal race. Marwa Al Ajooz, Bahrain’s other athlete in the fray, will hold Bahrain’s final hope at the Olympics on Saturday when she competes in the women’s 100m heat 3 kicking off at 10.45pm (Bahrain time). She has been grouped with athletes from Federation States of Micronesia Portugal, Sint Kitts and Nevis, Brazil, Sao Tome and Principe, Azerbaijan, Nigeria and Mexico. Despite the tough task, Marwa hopes to be among the fastest eight athletes in all five heats from Stage 1 and progress to the last heat in Stage 2, while the remaining athletes will be spread among the other heats according to their times. Bahrain sent four of its young and promising athletes to the Olympics, which got underway on October 6, with the closing ceremony scheduled for October 18. Ali Dawani and Maryam Sharif are the other two, who performed well in their respective events. Fifteen-year-old Dawani competed in the men’s singles, doubles and mixed doubles events in tennis championships but was out in the first rounds. Maryam, also aged 15, set up a new personal best record of 58kg in the women’s 48kg weight category in the weightlifting championship.